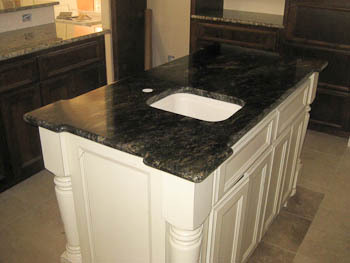 Asterix Granite anchors the island in this kitchen. 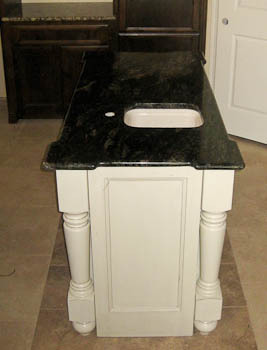 Looking for examples of a fancier kitchen island in a nice subdivision home? The island cabinets are a different color (white, off-white) than the other cabinets in the kitchen. 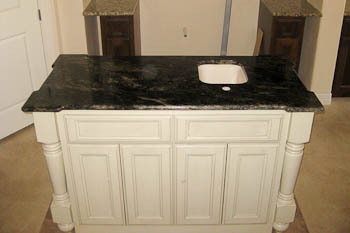 The surrounding cabinets are a dark espresso colored wood, topped with a lighter-colored granite than the island. 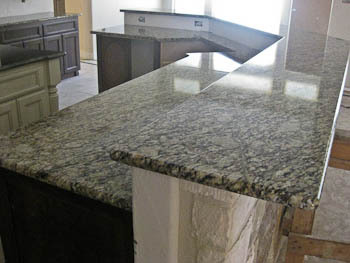 The addition of four island legs, and the custom shape of the island make what was a small island into a showpiece for this kitchen. The trim panel on the end of the island is a much nicer finished look the the typical plain, flat panel, and probably didn’t cost much extra to add to the plan. This stone is dark, almost black, with lovely swirling movement in greys, silvers and bronze running through it. 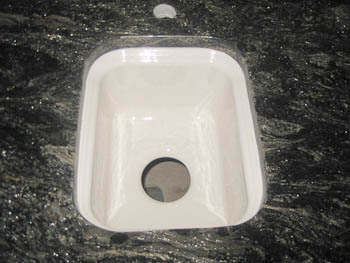 It is quarried in Brazil and has burst into popularity in the United States, despite being much more difficult to fabricate than other stones for countertops. It is similar to some of the busier slabs of Cosmic Black.